Blondes with dark eyes, of course we see them everywhere, and since being naturally blonde and having brown eyes is pretty rare, it's safe to assume most of these women (and some men) are bottle blondes...of course not to mention their roots.etc. I was thinking, as a guy, I generally don't find the brown eyes-blonde hair combo all that appealing. I prefer blonde women to have blue eyes (or green or at least light hazel), even if they aren't natural blondes. Brunettes can be just as beautiful as blondes, of course, and they can look beautiful with dark or light eyes. There's just something about blonde hair and brown eyes I generally find a bit unnatural. I think variety is cool. LOL... That pretty much describes me, but I don't color my hair. I am half German (the blond, taller part of me) and half Italian (the brown eyed, easily tanning part of me). My eyes are a light, golden brown and my hair is also more a golden blond with some light brown (not a light ash/bleach blond). I never realized I looked "unnatural." I have always gotten compliments about my hair/eye color. Oh well, my hubby seems to like it. I never realized I looked "unnatural." You don't, it's a perfectly normal combination. I think you just insulted my daughter, with her Irish/English/Italian heritage. 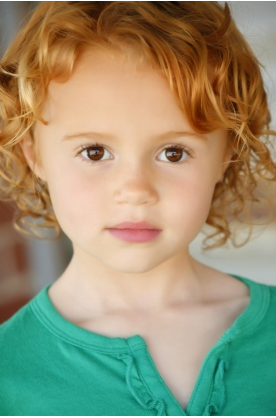 Beautiful honey gold hair with red tones, deep brown eyes, and freckles. The exact thing happens in my family. My older relatives' eyes have gone from warm brown, to hazel, and then more green as they age. Is this a common thing? In bright sunlight I can see a little bit of green in my brown eyes, so maybe they will change someday. That is a GORGEOUS color combination! Irish-Swedish, fair with hazel eyes and freckles. My hair is medium brown now but I had honey blonde hair until I was in college. I think you're thinking of women like Katherine Heigl, who is too dark-eyed to have hair that light. My boyfriend, thanks to an ethnic heritage blend that is solidly Italian on one side, and Scottish on the other, and he has fair skin and honey blonde hair paired with dark eyes. His brown eyes and very Italian last name are the only indicators of his Mediterranean heritage...the rest of his coloring is much more indicative of the northern European part of him. One thing to remember is that all blondes are not platinum or yellow-toned blondes. Strawberry blondes, and those with dark honey/golden blonde hair may look more natural with dark eyes than those with flaxen hair.